Quite a lot has happened since my last post. Most notably my husband and I bought plane tickets to Italy! We're leaving in late August and staying for two weeks. I can't wait! I'm very ready for a vacation, and I'm really excited to travel internationally for the first time. I'm attempting to learn (a little bit of) Italian, I found a really great podcast that I've been listening to while I'm on the bus. We've been roughing out our itinerary and soon we'll be making reservations at hostels and museums and buying train passes. I've already made a little countdown gadget for my Google homepage so that I can keep track of exactly how many more days until we leave. Our house has improved greatly in the past couple of weeks. We now have insulation! We hired some pros to install blown-in cellulose insulation. Our house was previously insulated with a few sheets of newspaper stapled to the exterior walls. Newspaper! In Minnesota! We also started drywalling our basement. We started with the ceiling, which is the worst and hardest part. But the good news is that after only one Saturday afternoon we are half done with the ceiling. The walls will be much, MUCH easier to do since we will not have to hold the giant pieces of sheetrock above our heads as we attempt to secure them in place. I've harvested some things from my garden. Mostly salad greens, garlic and rhubarb, but also some herbs, 3 currants and 8 strawberries. I'm hoping that soon we'll have tomatoes, tomatillos, onions, broccoli, cucumbers, green beans, grapes and assorted gourds. The chipmunks, birds and rabbits have also harvested a lot of things from the garden... about 47 strawberries, a gazillion currants and a brand new asparagus plant. As for crafty things, I've been knitting a lot. I worked on a swap package for Sarah the past few weeks, which I'll post pictures of later. I'm working on a third wrap skirt from Fitz Patterns. I've worked quite a bit on the Wheel of Mystery quilt, I'm probably two hours away from finishing the piecing of the top. 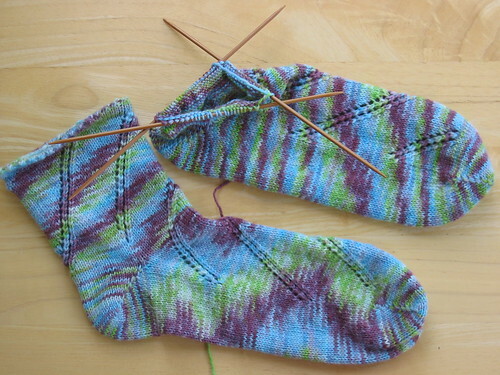 I've been slacking off on taking pictures of works-in-progress, the only picture I have is for my Anastasia socks. It's a rather sad picture. You'll notice that they look... different. I'm really not sure what could've caused the difference in striping. My gauge is the same, they're the same number of stitches, they're from the same ball of yarn. The yarn is hand-dyed (by me) so that could have something to do with it. Maybe it's the fact that the eyelets spiral in different directions? I think I'll have to do some math next time I dye yarn and either make it purposefully self striping or do a better job of making an un-pooling variegated yarn. I personally like differently striped socks, it shows how random nature is, the whole butterlfy in china is a storm here metafore, an itty bitty change makes a big difference. I LOVE the hat and bracelet... I am way impressed. And I agree with tekopp, I like the different striping on your socks. Each foot will have a different personality.